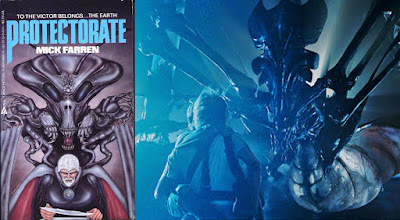 f) Cover art by Dan La Mountain for "Protectorate"(1985) inspired Alien Queen? h) Terry Gilliam's Giant Samurai from "Brazil" imprint on The Alien Queen? i) Did Ralph McQuarrie's Knobby White Spider concept help inspire Alien Queen? 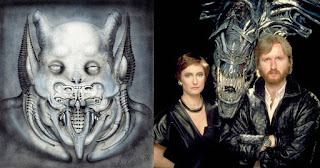 k) HR Giger's Demon (work 513) referenced in the design of the Alien Queen's face and hood? l) Alien Queen's elbow, inspiration from James Gleeson?